26th October – Drive drive drive! 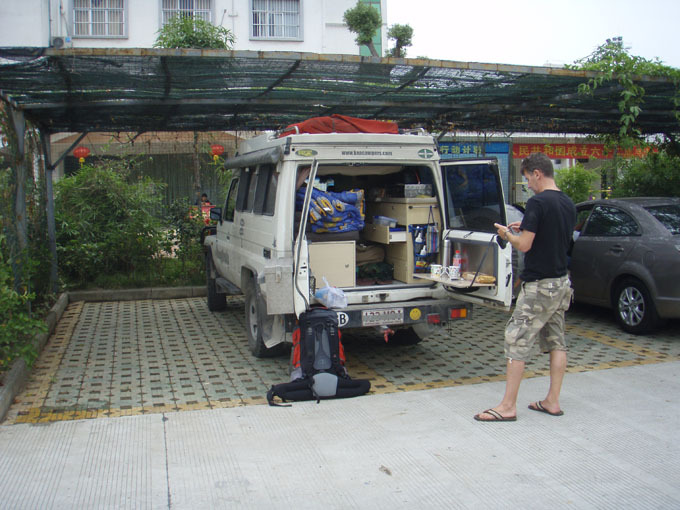 We took a slightly wrong turning and missed a link road early on in the day which meant that we took a decision to stick to freeways and head towards Nanning before swinging west towards Kunming. It seems a long way around but we thought it may be faster. The scenery along the freeway is great now, much more tropical and there is more open flatter land. Bananas, mangos, sugar cane are growing along with the normal rice and maize. We stopped frequently to have a drink and at lunch time cooked a pasta dish as the food at the services is buffet style and on the quiet roads can sit a long time …. The day went in a blur of freeways, toll booths and pleasant scenery. Driving on these roads is relatively easy as there is never much traffic. The lorries have a habit of driving in the overtaking lane and they are often loaded so wide as to obscure their mirrors, so overtaking requires caution. The lorries all have water cooled brakes and so there are frequent stations for them to refill the water tanks. You know when a truck is in front on the mountain roads by the fresh trail of water. We saw another couple of accidents along the way, one lorry had rolled on an emergency escape lane (they all looked well used!) and so not sure how good these brakes are. Someone told us that the trucks do not use engine breaking … not sure why? 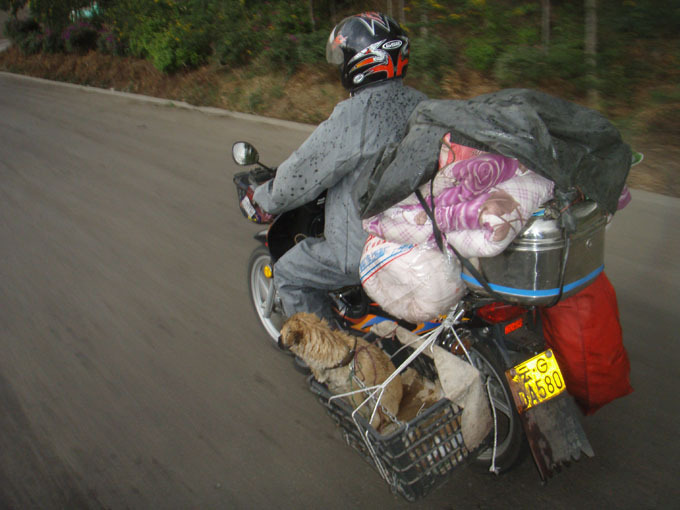 On one of the short sections of national roads we saw a man that will not leave his dog behind, however much he is carrying! We finally stopped after covering a whopping 820 km, by far the biggest days driving so far. It is a shame to rush through this area of China, but the way things are set up here does not lend itself to our style of travel. Bigger groups cheaper, but agreeing how far to go each day and where to stop could be a bit of a nightmare unless you all get on really well. Lovely though Spring is to travel with, the camper is small and not suited to more than two travelling. She was really good and rode in the back on most of the freeway sections of the trip. We still have a 500km day tomorrow and we are not sure which freeways are finished so again need to make a reasonably early start.